In the seemingly eternal quest for hierarchical supremacy in an era of competing rights, societal fragmentation and adversarial identity politics, you may have observed the emergence and proliferation of certain media ‘power lists’ – the Top 100/50/10 Asians, Women, Asian Women, Feminists, Gay Feminists, Asian Gay Feminists, Muslims, Sikhs, Blacks, Disabled, Secularists, Humanists, Secular Humanists, Gay Secular Humanists, Environmentalists, Haggis-making Nationalists, Sportsmen with Autism, Reggae-singing Rastafarians, etc, etc, etc. Many of these have become annual awards ceremonies of mutual back-slapping, cocktail-swirling congratulation, or published lists of incestuous or inflated minority influence. And each year hordes of hopeful and expectant nominees pore over the rankings to see who’s up, who’s down, who’s in, who’s out, who loses and who wins. Occasionally, the process is democratic, with shock eliminations and sensational X-Factorised results. Drama, drama. More likely, an elite group of self-appointed, self-important guardians of minority orthodoxy gather over filter-coffee and shortbread to make subjective assessments of relative influence, importance, accomplishments and power (ie, to gossip about whether they like someone and approve of their message). Occasionally you get the odd ‘Top Christians’ list: there’s a ‘12 Most Powerful in Hollywood‘ and ‘60 Most Influential (ever)‘ compiled by Premier Christian Radio in 2012 to mark the Queen’s Diamond Jubilee. Not sure why they went for 60, and no idea of the rationale for putting Harry Secombe above Sir John Tavener. But there it stopped. Again, not sure why. Now, you may balk at the whole notion of a ‘Top 100 UK Christians’ list of any sort, either because of its manifest parochialism or the obvious transgression of the gospel imperative that the last shall be first and the top shall be bottom, not to mention the whole judgmental window-into-men’s-souls discernment inherent in the process: is Tony Blair a Christian? Is David Cameron? What about Sir Cliff under suspicion? Is Cardinal Vincent Nichols a Catholic? Are Roman Catholics… O, you get the picture. You are entirely free to play it safe and nominate Aunt Doris for her faithfulness in arranging the flowers week after week; or Bob the organist for never playing a bum note in 30 years of pedal-pushing and stop-pulling at thousands christening, weddings and funerals. This is indeed commendable service for the kingdom. But in consideration of spiritual influence in the world, you must understand that we are dealing with Christians whose ministry is significant in the public realm; those who labour in the vineyard, contending for the Faith, whose fruits are discernible and compelling. Nominees must be living (ie not Mother Teresa or Martin Luther [King]), and a citizen of the United Kingdom (ie not Justin Bieber or the Pope [Emeritus]). Their ministry may, however, be wider than teaching, preaching or pastoring, and may be to anywhere in the world. As you ponder your nominee(s), consider not only the question of “What has this person done for us?” (where “us” is the Body of Christ and the communion of saints), but also “What has this person done for the mission of God and the cause of Christ in the world?” If their ministry is principally in and to the Church, have they sufficiently inspired others to follow Christ; to go out into the world and reflect upon the treasures of eternity? If their ministry is in and to the world, does it reflect the peace, love and truth of Christ? Does it radiate anything to distinguish it from secular social intervention? Do they build up or tear down? Are they gracious or haughty? Do they speak, sing or write with divine wisdom, artfulness and insight, or carp about carnal obsessions and material passions? In short, are their eyes fixed on Jesus? You will find the Nomination Form below. We may not reach 100, but nominations are open and democratic in order to gauge levels of support and discern spiritual impact. 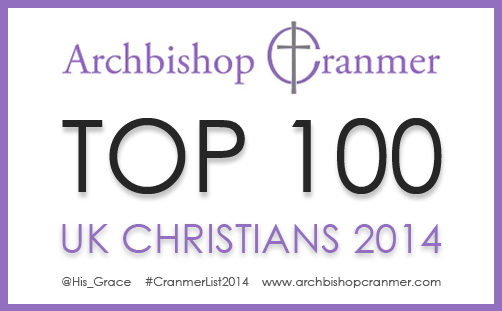 We hope to publish the Top 100 UK Christians list annually in December to coincide with the New Year’s Honours. Insofar as Aunt Doris may well top the poll and millions will be oblivious, please ensure that you include your reason(s) for nominating, as citations will necessarily accompany names. NOMINATIONS HAVE NOW CLOSED (as of midnight, 7th December 2014). Please don’t send any further suggestions as they will not be entertained. Bless you.